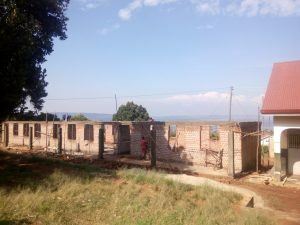 Last year, the classrooms previously used for the nursery students at Makonge Primary in Kiyindi were deemed unsafe due to structural instabilities, following a government inspection last year. This has meant that the 135 nursery students at Kiyindi Primary no longer have a separate space in which to learn and play. 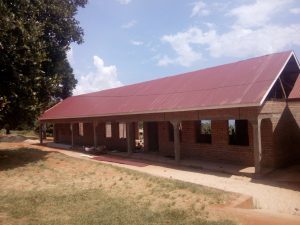 In August 2018 we began constructing a new block of nursery classrooms at Kiyindi Primary School in Buikwe, Uganda. Currently, the walls are being constructed. We are now almost halfway to the total funds needed to complete the build and need to raise a further £17,000 to complete and equip the new classrooms. Feb 2018- The roof is completed. The building began in August. Parents of the students at the school support this project and assisted at the groundbreaking for the new classroom block. The school have also raised some funds locally in support of the work. By the end of August, the foundations for the new classrooms have been completed. Building the walls began in December 2018. Once the walls are complete, we will need to raise further funds to complete the construction ready for the students to use! If you would like to support this project here are some ways to get involved! Join the International Needs Family and give monthly to our Education Projects. Take on a fundraising challenge! To kick-start the building of these classrooms one of our supporters David Whaite took on the ambitious challenge of running 100 miles in under 24 hours to raise funds. David Whaite ran 100 miles in under 24 hours and has raised over £17,500! 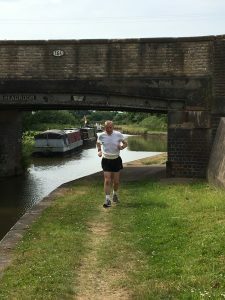 In June 2018, a few months before his 70th birthday, David completed his challenge in just 23 hours and 29 minutes and has so far raised over £17,500! Find out more about David’s run here! We need to raise a further £17,000 to complete the new nursery classroom block. Help us complete the new nursery classroom block at Makonge Primary! Donate to our Education Projects.